It’s the perfect pairing for Virginia golf packages: The remarkable Fred Couples-designed course at Westfields Golf Club and the well-appointed Westfields Marriott Washington Dulles Hotel. Whether you’re planning a family vacation, get-together with friends, business function or simply a fun, relaxing weekend, Westfields offers the best stay and play golf packages in Virginia. Packages are arranged for the perfect combination of playing and pampering. Most include luxurious accommodations, a hearty breakfast and a round of golf at the acclaimed Westfields Golf Club. Improve your game while enjoying the natural serenity of this “golfers’ dream” course, set in a Certified Audubon Cooperative Sanctuary. 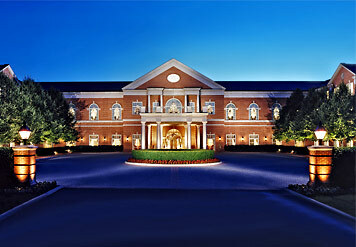 If you’re searching for the ideal Virginia golf resort experience, the Westfields Marriott Washington Dulles Hotel combines sophisticated meeting facilities with elegant hotel accommodations and exceptional Marriott service in a convenient Chantilly, VA location. Just seven miles from Washington Dulles International Airport and 30 minutes from downtown Washington, D.C., this hotel evokes the charm of Virginia's magnificent colonial estates and offers a vast array of resort activities.